It was not our first holiday in the desert, I usually like to point out. 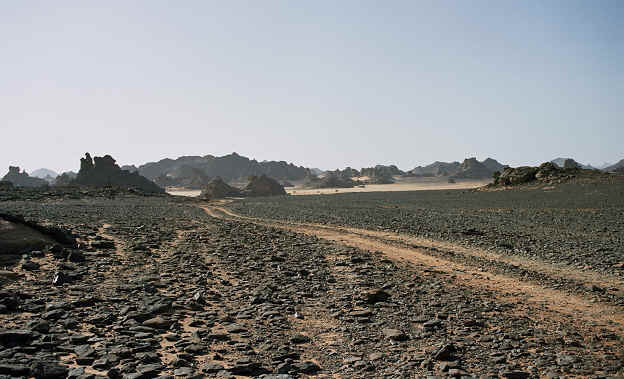 We have already known the northern Sahara a little since the year before my husband and I had experienced an especially impressive trip through the Libyan desert. So fascinating that we decided to do it again, this time on our own, without a group. Everything was organised by the agency Sahara Friends Tours - hhtp://saharafriendstours.com, whose service and professionalism we had appreciated a lot while travelling the southwest of Libya and through the Akakus mountains. With the internet and e-mail it was easy to establish contact with the agency. Our wishes were answered by Mohamed Ahmed, the owner of the agency. We were able to choose individually what we wanted to see and to visit, and how much of it. Everything was arranged by e-mail. What we really wanted to do was camel trekking. For most of our 20-day-trip we wanted to be on the back of a camel. 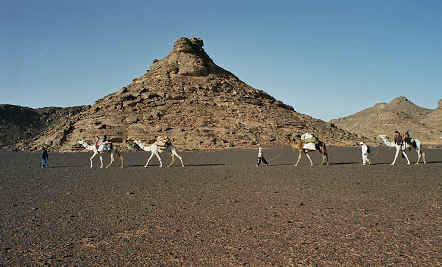 Apart from that we were very curious to see any lakes in the desert and we were deeply impressed by el Ma and Mandara. But to go there it was advisable to take the 4-wheel-drive. Our plan was to ride a camel for 12 days , have 5 days with the 4-wheel-drive and the remaining 3 days for arriving and leaving. Finally, the day of departure! We had carefully packed 2 big travelling bags and our every-day-backpacks. Starting in Munich we flew via Milan to Tripolis, the capital city. We were given a warm welcome by Abdala, who instantly recognised us. He was the one who had taken care of us last year upon arrival and arranged for the ongoing flight to Sebha. And it was here that life became different. Peace and calm took over although it was not easy in the beginning to follow this path. 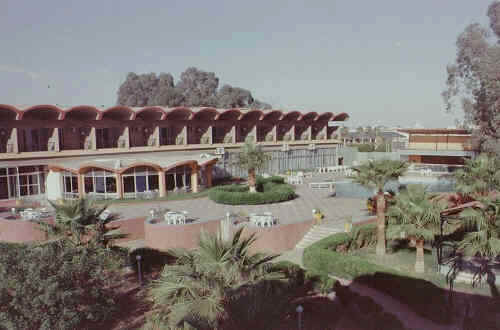 Along with many other travel groups of different nationalities we waited for our flight to Sebha. After an hour´s flight we received a very friendly welcome and were taken to our hotel. Everything was well organised and we moved to our room without problems. At 10 o`clock the next morning after breakfast a short meeting was held to discuss the tour. Then our luggage was packed in the vehicle. We were delighted to meet Achmed again who took care of us very well during our last tour and who would also accompany us this time. Achmed is an expert when it comes to deserts and tourists. Before we headed for the desert we shopped for fresh food. Bread, vegetables, fruit and meat were bought and packed for the desert. Buying is a men`s job! We realised, there are professionals at work. Then we started and headed for Ghat, approx. ????? km. The bitumen road was as straight as a ruler. Nearby we saw the first camels and I was all excited and curious about when we would meet our camels. There were hardly and sand dunes to be seen. There were endlessly wide areas of stones and clay varying from black to yellow via red on both sides of the road. There was little traffic, a few trucks and sometimes we saw a flock of landrovers heading for the desert carrying groups of tourists. We enjoyed the privilege of being a group of 2. With our small bus we sped along the road and we didn`t realise the heat outside, our car was air conditioned. Only when we got out of the bus at a petrol station we felt the sun shining on us, blisteringly hot. Later we stopped again for a small lunch. The scent of the fresh bread had spread in the car and after enjoying it with some cheese and wonderfully aromatic tomatoes we continued. Now the dunes at the horizon were becoming clearer and clearer and we knew we were quite close to our destination. Dark shadows appeared in the distance. They were rocks and the closer we got the more bizarre the shapes became. Using your imagination, you got some fantastic shadow formations against the sun. The first houses of Al Awaynat appeared so we knew, Ghat cannot be much further. It was Ramadan, everything was closed during the day. Big tall metal gates hid the shops which usually were so lively and busy. But there was nothing, not even a stray cat or a dog looking for food. Also in Ghat all was quiet and empty, it looked like we were the only tourists, even in the old town. The walkways between the high walls appeared deep and narrow and according to the sun light, hot or shady and pleasantly cool. One could not see the houses and buildings behind these walls, they were either well protected or skillfully built into one another in order to get as much shade as possible. Only very few flats were still in use and we got the feeling of being in a real old desert town. Nobody was outside here either. The only person we met was an old tradesman who let us have a look through wooden doors to his shop (jewellery), a black room after the bright sun outside and it took a while until our eyes got used to the dark and we were able to recognise the silver jewellery on the tables. Then we got led to a plateau through a labyrinth of walkways. From here we had a wide view over the old town and the new Ghat. From here one could see Ghat, the desert town, and it seemed to be surrounded by an endless desert. Very impressive! After the sightseeing tour we drove to our night camp under open skies. Upon arrival everything had to be unloaded from the bus. Quite some luggage when you saw it all lying around in the sand; water, food, gas point and gas cooker, mats and blankets. Everything you needed for our little 12-day-trip was thought of. The setting sun draped a fascinating light over the mountain range that had been formed by wind and sand. If anybody suggested there was a fort in the mountains one would be inclined to believe it. Then it happened! What a picture it was, this moment our 5 camels with the guides appeared in the distance. Already Achmed was busy preparing our supper: vegetable soup and pasta, which is called Macca here, bananas and dates for dessert. Delicious! Meanwhile night had fallen over us but that didn`t stop our group from having fun. It was teatime and we were being served traditional tea. This ritual ended each of our days and every time it was a celebration. Ali, the tea master, proved to be the greatest of his kind. Unfortunately it was time for Mohamed, our driver, to return to Sebha. 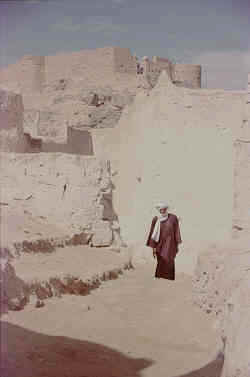 His mission, which was to hand us over to our guides and camels, was fulfilled. The first night in the hotel of innumerable stars had come and it was nice and cool. By the time we got out of our sleeping bags the next morning, Achmed had prepared everything for breakfast. Ali and Osman were busy packing the camels for the first tour. 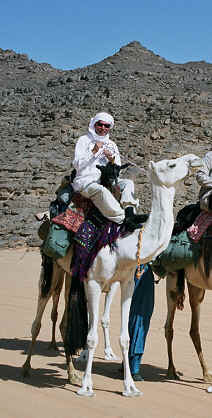 It took some time until everything was stored away and the riding camels were ready to take us. My husband and I enjoyed the peace and calmness with which everything was taken care of and we carefully tried to establish first contact with our camels. Ready - we were up and ready to go! The caravan was moving towards the mountain range. We quickly adapted to the rhythm of walking, which we remembered vividly. It was getting calmer and calmer and finally there was only the familiar walking of the camels, the sound of the stones being hit while walking and the occasional bird singing. Peace, lovely and desired, peace for our distressed souls. There was little talking, no need for words. We rode approximately 2 hours until it was time for lunch. The camels were being unpacked and even they needed a rest in the midday heat. There were a few tasks that my husband and I could already do to establish our salon, as I liked to call it. This meant, the carpet, on which we usually had lunch, and the mats, useful for everything, ot rolled out. 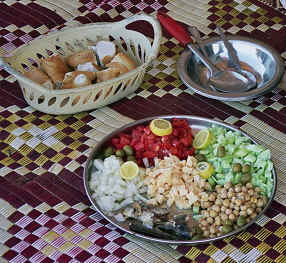 Achmed did the vegetables and prepared a delicious salad for lunch. Lunch was followed by a wonderful time of idling with nothing to do but looking around, napping, reading, writing the diary or anything else you wanted to do or leave. The sun was shining strongly and our guides watched carefully that we stayed in the shade because only then was the break refreshing. We didn`t need a watch to tell that it was time to move. When Ali or Osman got the camels we knew soon we`ll be on our way. There was no rush or time pressure, things got quietly stored away and packed and then the caravan was about to move again. In a pleasantly levelled way we moved forward, mostly silent. Curious and amazed we inhaled the environment. We left yesterday´s stage with its mountain range far behind us and the rock formations ahead of us became bigger and clearer. The next day we were to climb over these rocks, reaching the entrance to them was the goal of today. Until the sun set it gave a warm and intense show of colours in the desert. We arrived at our camp and everybody helped to unload. There was enough time to climb a dune and to watch the sun finally set behind a rock. Everything was quiet yet spectacular. No rush whatsoever. What a wonderful feeling! We enjoyed the desert but the smell of soup floated through the air and we returned to the camp. 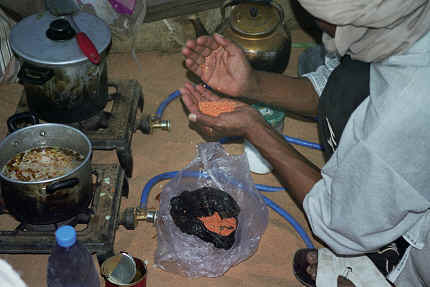 Achmed, the chef, called us for supper and we had the soup, a main course and fruit and nuts for dessert, if wanted. It always tasted nice, my favourite dish was couscous, my husband preferred noodles. From previous trips we knew that it is unusual for our guides to be eating with us but the more time we spent with each other the more familiar we became. Later we got invited to the fireplace. Every day ended with drinking tea at the open fire. It was fascinating to watch the ceremony, Ali prepared a sweet strong green tea by pouring it from one container into another one until it was ready and he handed it to us in small thin glasses. We tried and listened to the conversation of our guides who talked in Tamaschek, a Tuareg language and, of course, we didn`t understand a word. But we listened to the sound of the dialogue and sometimes they sing. It was incredibly beautiful to look up this glorious, shining starry sky and give in to the atmosphere of the open fire, the tea and the sound of voices, singing and talking away. Finally we got tired, we said good night and moved over to our sleeping place under the wide and open sky. While we were eating the camels also tried to find some food in the desert. Even though their legs were tied together they could walk amazingly long stretches, day and night. Long after dark one of our guides went out to look for them. We really didn`t know how he could trace them in the dark. During the night the camels were lying close to our camp, ruminating. A new day! When the night handed over the day to light, the horizon turned lighter and brighter. The stars turned pale and eventually became invisible, while the sun was still hiding. Its rising gently produced the most intensive colours; rocks and dunes were in deep red outlines, a small stripe of orange flowing into yellow into a shining turquoise and then finally into a soft and natural daylight. A grand and unique adventure. Once the sun was starting to warm us, we got up and started the day with our little morning routine. Then we packed our sleeping bags and other stuff. Breakfast was ready - our guides had already been up and active for quite a while. They had done their morning prayer and had breakfast. With tidying up and packing we were ready to help, I took over the dish washing, my husband helped with “male” tasks. When loading the camels, everyone called out for Wiiillllliiiii, for the water canisters were quite heavy. It was very interesting to see all the traces of little animals which we could find all around. Achmed explained the names of them. Many people have asked us, whether the trip was dangerous, but the answer is, no, it wasn`t. Even during the day all we saw were little lizards, geccos or bugs. The animals were shy and fast as lightning. By the time we were able to spot them they were long gone. Once during lunch time we saw a lizard watching us just as curiously and intensely as we watched it. Snakes could only be seen by the traces they left in the sand but these drawings were wonderful and very impressive. However, our guides were attentive and protective, we had nothing to worry about. We felt safe and secure in every way. My camel was a bit smaller and more slender. 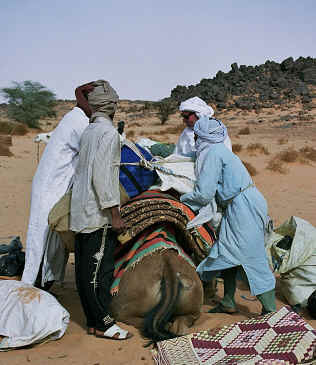 All the camels were very well trained and treated with care and thoughtfulness by their owners. I preferred to walk a bit and I kept finding many beautiful stones. I could have become stone-rich here! But not only looking down at the ground was fascinating but also gazing in the distance at the Akakus with its changing dunes and rocks. The forms and shapes were breathtaking. The tireless game of wind and sand was an irresistible invitation for our fantasy. The soft curve of the dunes was of quiet dynamics; transiency and imperishability were close together and our traces would be quickly washed away leaving the scenery untouched, as if we had never been there. Time had a different meaning. Time reigned not over things, but things defined time. 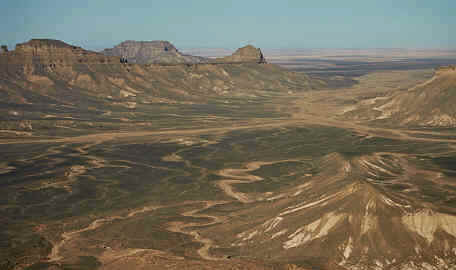 We enjoyed the calm, the wide expanses of the desert and the naturalness, with which everything was happening. Every day was full of new impressions and beautiful things. But even with the days passing slowly and without hurry, 12 days were bound to be over some time. The next day we were to be picked up by the 4-wheel-drive to take us to the high sand dunes of Wang Casa und on to the Lakes Mafun and Gaberon. This was our last evening, the last tea made by Ali, together with Osman. We had to say good-bye to them and our camels. Sadness was coming over us and supper was not as funny as usual. Soon we went to sleep. The next day we watched the caravan move on, touched and sad, without us. The time together had tied us together. We are positive, this was not our last journey with camels.